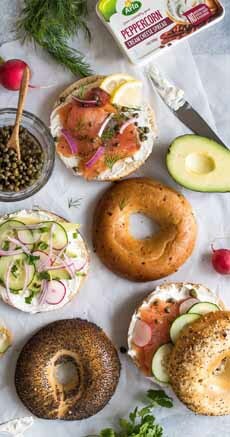 July 26th is National Bagelfest Day, the perfect day for that article, which features delicious bagels with different savory and sweet spreads and toppings—including those off the beaten path. So if you want a true bagelfest, check out the article. Today, we’ll make the record clear on the history of bagels. One legend traces the history of the bagel to the shape of a stirrup, to commemorate the victory of Poland’s King Jan Sobieski over the Ottoman Turks in 1683’s Battle Of Vienna. This is not true. It mirrors another legend of the creation of another popular bread that allegedly commemorates this battle: the croissant. The story is that the croissant was shaped for the crescent in the Turkish flag; that is to say, to symbolically eat the Turks. Here’s the real history of the croissant. What is it with these legends regarding bread and the Battle Of Vienna? The bagel was actually invented much earlier in Kraków, Poland, as an alternative (some would say, improvement) on the bublik, a traditional Polish-Russian roll that’s also very close to the Turkish simit (photo #3), and which some historians call the ur-bagel. It looks like a sibling of the bagel, but with a much bigger hole and a recipe to make it even denser and chewier than the bagel that emigrated to New York. The bublik was originally designed for Lent, but in the 16th century began to become a staple of the Polish diet. The bagel was evolution, not revolution. Other countries also had round, individual-serving breads with a hole in the middle (the hole was used for convenience in delivery (strung through with a string) and space-saving at stores and homes. They were also stacked on poles and hawked in the market place). Examples include Greek koulouri (with sesame seeds), Finnish vesirinkeli, and ciambella in Puglia, Italy. The first documentation of the bagel is in a 1610 list of sumptuary laws. Many food historians believe that bagel originated from the German word beugal, now spelled bügel, which has numerous meanings, including stirrup and ring. Traditional handmade bagels are not perfectly circular but slightly stirrup-shaped, a function of how the bagels are pressed together on the baking sheet. Variants of the word beugal are used in Yiddish and Austrian German to describe a round loaf of bread. Yeasted wheat dough is traditionally shaped by hand into a ring shape, around four inches in diameter. In the U.S. today, they are supersized. Measure the next bagel you buy! With true bagels, the rings are then boiled in water for about a minute. This sets the crust, resulting in the firm, shiny crust of a true bagel. The longer the boil, the more dense and chewy the interiors—along with the use of high-protein flour to make the dough. They then get pressed face down in the seeds or other toppings. These days, there are also different dough types such as bran, oat, pumpernickel, rye, whole-grain and gluten-free. Bagels came to the United States with Eastern European Jews, who began to immigrate to the United States in significant numbers after 1880. Make your own bagelfest! A luscious bagelfest from Arla Cheese. Got smoked salmon? They have it at Good Eggs. 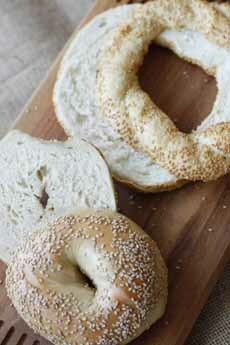 A comparison of bagel and simit, the latter considered the ur-bagel (photo by Elvira Kalviste | THE NIBBLE). However, they didn’t eat them with cream cheese and lox, but with schmaltz (rendered chicken fat—here’s a recipe) and herring. Modern cream cheese wasn’t invented until 1872, in the U.S.(cream cheese history). 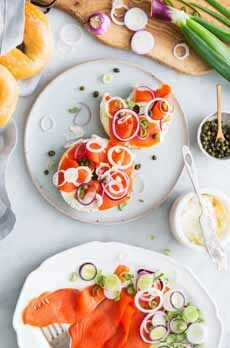 Lox wasn’t known by Eastern European Jews until Jewish immigrants met Scandinavian immigrants [source]. Bagel bakeries thrived, and by the early 1900s in New York City, they were controlled by Bagel Bakers Local 338, which had contracts to supply bagel bakeries in and around the city for the workers who prepared all the bagels by hand. Bagel bakeries were soon found in major cities with large Jewish populations, in Canada as well as the U.S. They became a mainstream food in the last quarter of the 20th century, partly due to the efforts of the second generation at Lender’s Bakery in New Haven, Connecticut. The son of the founder, Murray Lender, pioneered automated production and distribution of pre-sliced frozen bagels 1960. While early bagels were plain or poppy, they evolved in the 1960s to other popular flavors, like garlic, salt and sesame. The cinnamon-raisin bagel appeared in the mid-1950s. Can’t decide? Have it all (mostly) on an everything bagel (here’s the history of the everything bagel, which debuted around 1980). Cream cheese rose to the occasion, appearing in flavors like pimento, olive and smoked salmon. And bagels became not just breakfast bread, but sandwich bread for lunch. Not to mention that double-comfort food, the pizza bagel. By the turn of the 21st century, you could get a blueberry bagel, cheddar bagel, a jalapeño bagel…any bagel your heart desires. And just about any flavor of cream cheese, too. More recently, bagels headed into space with Canadian-born astronaut Gregory Chamitoff, who took a batch of bagels on his 2008 Space Shuttle mission to the International Space Station. What did he take? Eighteen sesame seed bagels. The record does not say if he brought cream cheese or lox. *It is made in most of Central and Eastern Europe. Raisin-walnut spread from Eat Wisconsin Cheese. 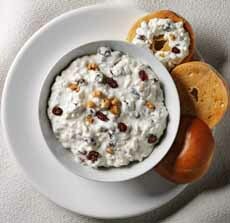 The trade organization created a lighter version of a cream cheese, raisin and walnut spread by using half cottage cheese. But you can go full cream cheese. If you like raisin bagels, or raisin and walnut cream cheese, here’s a spread to match from Eat Wisconsin Cheese. It’s made lighter by substituting cottage cheese for part of the cream cheese. Or, you can substitute cream cheese for the cottage cheese. 1. COMBINE all ingredients in medium bowl, using a spoon or electric mixer. Blend well. 2. COVER and chill 4 hours or overnight, for the flavors to meld. Serve with toasted bagels, toast or muffins.